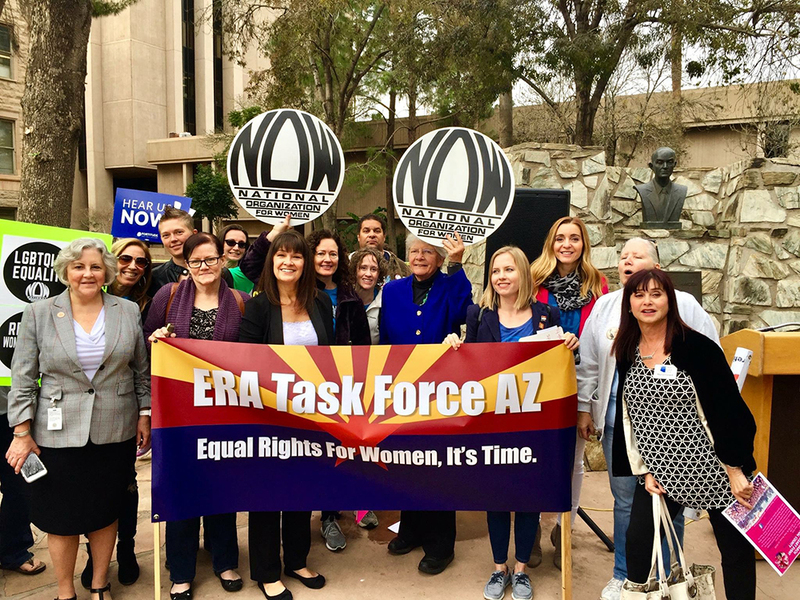 Ratification of the Equal Rights Amendment (ERA) in Arizona was in the news and in the streets this week. ERA supporters launched an ambitious 38 Mile March for the ERA through the streets of Phoenix– starting at the Capitol on Monday, March 11 and ending there on Wednesday. After the speeches, supporters filled the gallery of the Arizona Senate, and a contingent of 30 or so supporters went to the Arizona House. In the Senate, there was a motion to suspend the rules and vote on the ERA. In the House, Democrats attempted to introduce the ERA supporters in the gallery and were shut down when the Republicans decided to police the content on our speech– in addition to strictly limiting our time to one minute. 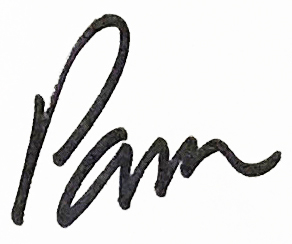 The news stories covered the Senate action because that was the official vote. 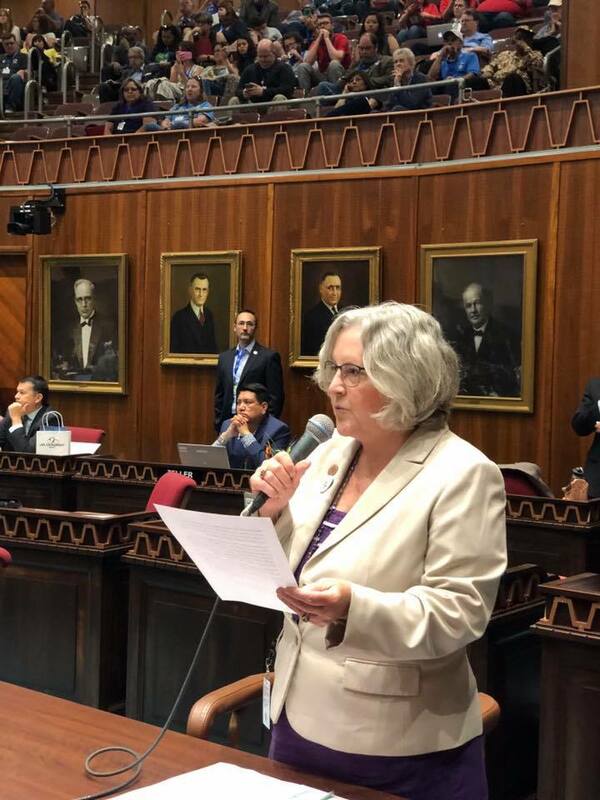 They didn’t cover the censorship fiasco in the Arizona House. I gave one of the first ERA introductions and was allowed speak. Later introductions were cut off by the Republicans. Patriarchy and suppression of speech were on full display. You can watch the whole scene here on the official video. Points of Personal Privilege start at around 2 minutes. Note the lengthy introductions that are allowed for people who are representing other groups– not the ERA. Rep. Athena Salman starts the ERA introductions at about 10:28 minute mark. She and I both got through our introductions without interruption. Things heat up when Minority Leader Charlene Fernandez (at the 13:16 minute mark) tries to introduce an ERA marcher from Rep. Warren Petersen’s district and is gaveled down and scolded by Speaker Pro Tempore T.J. Shope. At 15:43, Shope shuts down Rep. Raquel Teran and tells the gallery to be quiet. At 17:08, Rep. Randy Friese is not shut down. 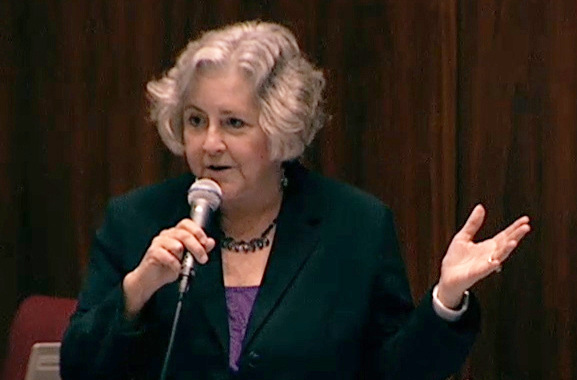 At 18:14 Rep. Mitzi Epstein is shut down and protests Shope’s censorship of her speech. 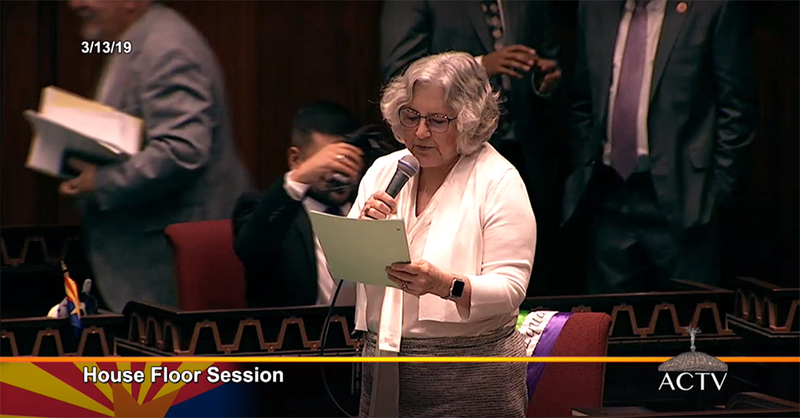 At 20:25, Rep. Isela Blanc is allowed to introduce her student shadow, but when she starts the ERA introduction, she doesn’t get more than a few words into her introduction before Shope stops her. At 21:17, Salman reads the rule book and calls out the Republicans for censoring our speech. The gallery and the Democrats burst into applause and get the gavel. The rules limit the amount of time we can speak to one minute but not the content. The scene devolved after Shope ruled Salman out of order. Friese protested the ruling of the chair and called for a roll call vote (23:05). This resulted in multiple speeches about the ERA and freedom of speech– and multiple women being called out of order for speaking truth to power. I watched the whole fiasco on video, and it is shocking how many women were disrespected– House members and women in the gallery.